Italian company founded in 1921 by Giovanni Alessi and concentrated on metal kitchenware. 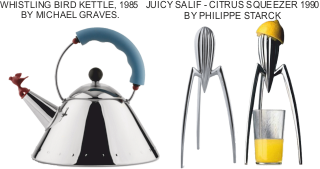 His products and designs of coffee pots became so popular, that by 1924 the brand name ‘Alessi’ was established. In the1930s, Giovanni’s son Carlo, joined the family company, which quickly progressed to the use of stainless steel and away from utilitarian designs, to more adventurous ones, mass producing desirable, high quality, everyday household products. 1950s: The company broadened it’s approach, collaborating with well-known designers. The aim was to break away from modernism and even traditional designs and to try a more unconventional design ideas, including those from groups such as, Studio Alchima (Alessandro Mendini) and Memphis (Ettore Sottsass). 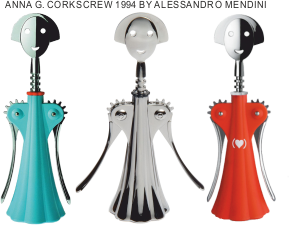 Other designers associated with Alessi include Aldo Rossi, Philippe Starck and Michael Graves. QUALITY PRODUCTS, REFLECTING A VERY HIGH STANDARD OF CRAFT WORK AND MANUFACTURING. OFTEN DESIGNED BY FAMOUS, WELL-KNOWN DESIGNERS, WHO APPLY THEIR OWN STYLE AND EXPERIENCE TO EACH PIECE. DESIGNS EVOKE EMOTIONS AND MEMORIES AND ARE OFTEN FUN. UNUSUAL, STYLISH AND FUNCTIONAL PRODUCTS. DESIGNS THAT STAND OUT AND BECOME THE FOCUS OF DISCUSSION.